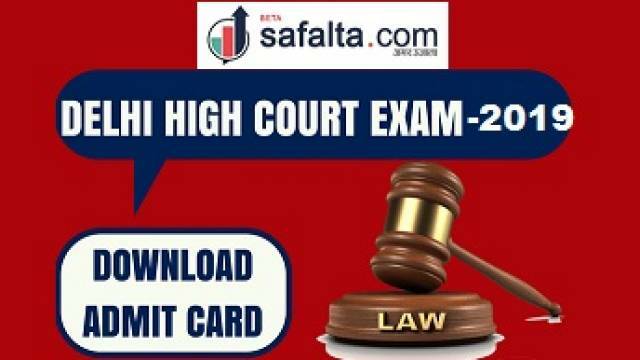 Delhi High Court has released the exam admit card for Junior Judicial Assistant exam. The admit cards have been released on the official website on 12 Feb 2019. The exam is scheduled to be conducted on 24 Feb 2019. A total of 60 vacancies will be filled through the recruitment process in Junior Judicial Assistant posts. Delhi High Court has released the exam admit card for Junior Judicial Assistant exam. The admit cards have been released on the official website on 12 Feb 2019. The candidates who have applied for the recruitment drive should visit the official website to download their exam admit card. On the homepage, click on the ‘Job Openings’ under ‘public notices’. Now enter your registration no. and password in the prescribed format. Save a copy of your admit card and take a printout to appear for the exam. The exam is scheduled to be conducted on 24 Feb 2019. A total of 60 vacancies will be filled through the recruitment process in Junior Judicial Assistant posts. For more updates, keep checking the official website. Also, keep an eye on safalta education portal for the latest updates on competitive exams.